Horn Rapids has been a favorite to those looking for an ease of commute to companies like Hanford, PNNL, and the various Department of Energy subsidiaries. Horn Rapids is also a retirement destination for those interested in the 18 hole championship golf course. Horn Rapids enjoys close vicinity to some of Richland's finest parks like Leslie Groves and Howard Amon, both of which border the Columbia River. There is fun for the entire family as Horn Rapids hosts a swimming pool and many parks. The Horn Rapids community is a great place for families of all sizes and ages. The community offers a wide variety of amenities for families young and old, there are the swimming facilities for all ages to enjoy. The avid golfer will enjoy the 18-hole Championship Golf Course as well as the full-service Clubhouse. Anyone who enjoys spending time outside running, walking or biking will love the miles of interconnected sidewalks and walking paths inside the community, not to mention the miles of paths outside of Horn Rapids. 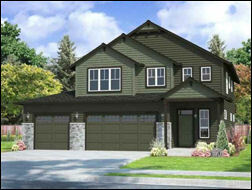 There is no limit to possibilities a person could enjoy while living within the Horn Rapids Community. As an added bonus you may be interested to hear that the Tri Cities community, home of Horn Rapids, has been ranked as one of the Top Places to Begin a Second Career and one of the top places to raise a family.